When dealing with a document collection, it is important to identify repeated information. In multi-document summarization, for example, it is important to retain widely repeated content, even if the wording is not exactly the same. Simplistic approaches simply look for the same strings, or the same syntactic structures (including words), across documents. Here we investigate semantic matching, applying background knowledge from a large, general knowledge base (KB) to identify such repeated information in texts. Automatic document summarization is the problem of creating a surrogate for a document that adequately represents its full content. Automatic ontology generation requires information about candidate types, roles and relationships gathered from across a document or document collection. We aim at a summarization system that can replicate the quality of summaries created by humans and ontology creation systems that significantly reduce the human effort required for construction. Both applications depend for their success on extracting the essence of a collection of text. 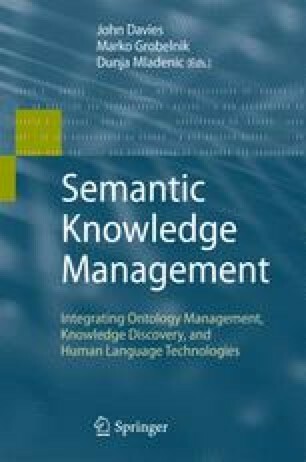 The work reported here demonstrates the utility of using deep knowledge from Cyc for effectively identifying redundant information in texts by using both semantic and syntactic information.